A brief overview of the range of indices that FTSE International (FTSE) have created to measure the equity markets in the UK. The FT30 Index was first calculated in 1935 by the Financial Times newspaper. The Index started at a base level of 100, and was calculated from a subjective collection of 30 major companies – which in the early years were concentrated in the industrial and retailing sectors. For a long time the Index was the best known performance measure of the UK stock market. But the index become less representative of the whole market. Also the index was price-weighted (like the DJIA), and not market-capitalisation-weighted. Although the index was calculated every hour, the increasing sophistication of the market needed an index calculated every minute and so the FT30 has been usurped by the FTSE 100. Articles on the FT30 Index. Today, the FTSE 100 Index (sometimes called the “footsie”) is the best known index tracking the performance of the UK market. The index comprises 100 of the top capitalised stocks listed on the LSE, and represents approximately 80% of the total market (by capitalisation). It is market capitalisation weighted and the composition of the index is reviewed every three months. The FTSE 100 is commonly used as the basis for investment funds and derivatives. The index was first calculated on 3 January 1984 with a base value of 1000. The FTSE 100 Index, and all the FTSE indices, are calculated by FTSE International – which started life as a joint venture between the Financial Times newspaper and the London Stock Exchange, but is now wholly owned by the LSE. Articles on the FTSE 100 Index. Similar in construction to the FTSE100, except this index comprises the next 250 highest capitalised stocks listed on the LSE after the top 100. The index is sometimes referred to as the index of “mid-cap” stocks, and comprises approximately 18% of the total market capitalisation. Articles on the FTSE 250 Index. The FTSE 350 is simply an index comprising all the stocks in the FTSE 100 and FTSE 250 indices. Articles on FTSE 350 Index. Comprised of companies with a market capitalisation below the FTSE 250, but above a fixed limit. This lower limit is periodically reviewed. Consequently the FTSE Small Cap Index does not have a fixed number of constituents. In mid-2012, there were 248 companies in the index, which represented about 2% of the total market by capitalisation. Articles on FTSE Small Cap Index. The FTSE All-Share is the aggregation of the FTSE 100, FTSE 250 and FTSE Small Cap indices. Effectively all those LSE listed companies with a market capitalisation above the lower limit for inclusion in the FTSE Small Cap Index. The FTSE All-Share Index is the standard benchmark for measuring the performance of the broad UK market and represents 98-99% of the UK market capitalisation. Articles on the FTSE All Share Index. This index comprises the companies that do not meet the minimum size requirement of the FTSE Small Cap Index and are therefore outside of the FTSE All-Share Index. In mid-2012 there were 112 companies in the FTSE Fledgling Index. Articles on FTSE Fledgling Index. This consists of all the companies in the FTSE Small Cap and FTSE Fledgling indices. Reflects the performance of companies in the Technology, Media and Telecommunications sectors. An index of all companies included in the LSE’s techMARK sector. The top 100 companies of the FTSE techMARK All-Share, under £4bn by full market capitalisation. Comprises the 50 largest UK companies quoted on the Alternative Investment Market (AIM). Comprises the 100 largest companies quoted on the Alternative Investment Market (AIM). It’s January, so let’s talk about the January Effect. But which January Effect would that be? We’ve come across three different uses of the term. A quick overview follows. The most common use of the term January Effect describes the tendency of small-cap stocks to out-perform large-cap stocks in January. 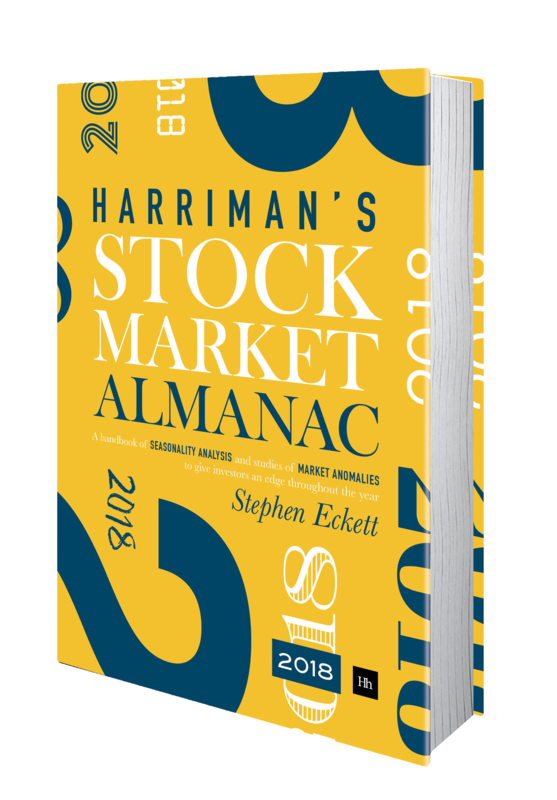 In 1976 an academic paper found that equally weighted indices of all the stocks on the NYSE had significantly higher returns in January than in the other 11 months during 1904-1974. This indicated that small capitalisation stocks out-performed larger stocks in January. Over the following years many further papers were written confirming this finding. In 2006 a paper tested this effect on data from 1802 and found the effect was consistent up to the present time. The UK market experiences the same January Effect as seen in the US market. The small cap out-performance in January is significantly strong: the FTSE Small Cap Index has out-performed the FTSE 100 Index by an average 3.7 percentage points in all Januaries since year 2000. And the small cap index has under-performed the FTSE 100 Index in just one year in the past 13. 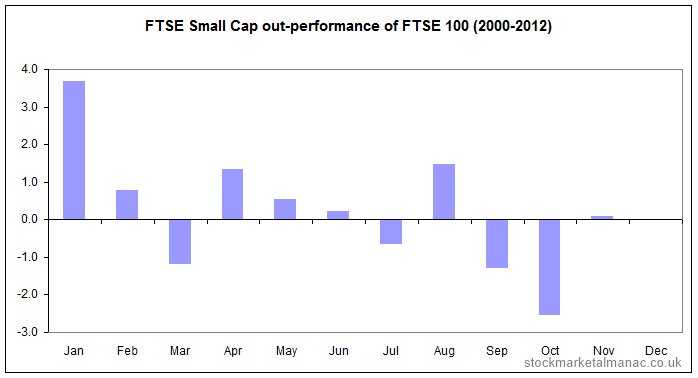 The following chart shows the average FTSE Small Cap Index out-performace of the FTSE 100 Index for each month since 2000. Historically, the returns in January have signaled the returns for the rest of the year. If January market returns are positive, then returns for the whole year have tended to be positive (and vice versa). This is sometimes called the other January effect, or January Predictor or January Barometer and was first mentioned by Yale Hirsch of the Stock Traders Almanac in 1972. A variant of this effect has it that returns for the whole year can be predicted by the direction of the market in just the first five days of the year. Academic research has largely found that January returns can predict the rest of the year, but there is some doubt as to whether the effect can be exploited. and similar for the other months. In 1942 Sidney B. Wachtel wrote a paper, “Certain Observations on Seasonal Movements in Stock Prices”, in which he proposed that stocks rose in January as investors began buying again after the year-end tax-induced sell-off. Looking at the returns for the FTSE 100 Index since 1984, it is true that they tend to be positive – but not strongly so. The index has risen in 57% of all Januaries since 1984 with an average increase of 0.3% – which ranks it in eighth place of the 12 months. 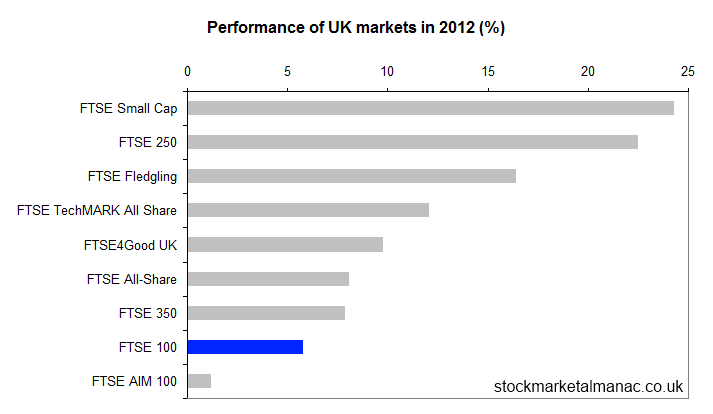 The following chart shows the performance of the main UK stock market indices in 2012.